Acknowledged author wrote OIL+GAS LAW:CS.+MTRLS. Clean: Limited cribbing or fill-in's@ DUE 4/18,CLN @ comprising 1559 pages back in 2016. Textbook and etextbook are published under ISBN 1683288327 and 9781683288329. Since then OIL+GAS LAW:CS.+MTRLS. Clean: Limited cribbing or fill-in's@ DUE 4/18,CLN @ textbook was available to sell back to BooksRun online for the top buyback price of $63.36 or rent at the marketplace. This new edition of the popular textbook on the law of oil and gas focuses first on ownership of the resource. Chapter 1 examines the common law of oil and gas ownership and the remedies that protect and restrict ownership rights. Chapter 2 focuses on the foundational business relationship used to develop oil and gas in the United States―the oil and gas “lease.” Chapter 3 examines common problems encountered in oil and gas conveyancing. Chapter 4 explores legislative and regulatory responses to problems created by common-law ownership concepts, focusing on oil and gas conservation law. Chapter 5 examines the body of law designed to regulate environmental impacts by following the oil and gas development process chronologically, from land acquisition to abandonment. Chapter 6 considers transactions other than leasing and conveying that are frequently encountered in the industry, including assignments, farmouts, operating agreements, drilling contracts, and gas sales contracts. Finally, Chapter 7 examines the complex body of law that must be considered when oil and gas development is taking place on property owned by the federal, state, or tribal governments. 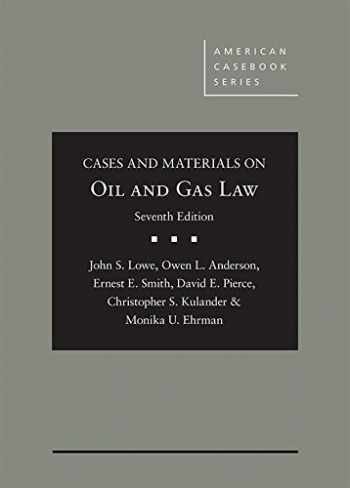 Many instructors will build the basic oil and gas law course around Chapters 1 through 4 and save Chapters 5 through 7 for advanced courses.The book is completely updated, reflecting new case law in the traditional oil and gas states and evolving case law in eastern states. The book is further updated to cover shale oil and gas resources.